Kelly Says Trump Now Believes Border Wall Is Unnecessary : The Two-Way The chief of staff says that candidate Trump was not "fully informed" on border issues and that he's persuaded the president that the wall is not needed. 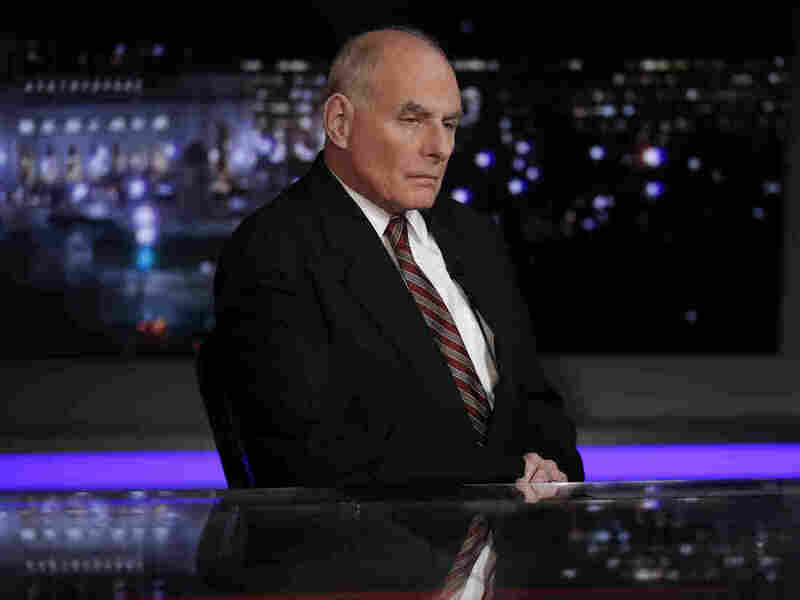 White House chief of staff John Kelly pauses to look to a video monitor as he appears on Special Report with Bret Baier on Fox News in Washington, on Wednesday. White House Chief of Staff John Kelly told a caucus of Hispanic lawmakers on Wednesday that he has persuaded President Trump that building a wall along the U.S.-Mexico border is unnecessary, signaling a possible reversal on the key campaign promise. Kelly, who was secretary of Homeland Security before taking over as chief of staff in July, said that candidate Trump had not been "fully informed" about the border situation when he pledged repeatedly on the campaign trail to build the 2,200-mile wall and get Mexico to pay for it. Perhaps no other issue resonated more with Trump's supporters, many of whom took up the chant of "Build the Wall!" at his campaign rallies. The meeting with members of the Congressional Hispanic Caucus took place on Capitol Hill amid a larger discussion involving continued funding of the government and immigration that includes the fate of the Deferred Action on Childhood Arrivals, or DACA, an Obama-era program to protect the children illegally brought to the U.S. by their parents from deportation. In an interview later with Fox News, Kelly said, "there are places where hydrographically, geographically, a wall would not be realistic. There are other parts of the southwest border that are so wild and untamed that there is no traffic that goes through them," adding there are other places where the existing fencing "would suffice." The president, Kelly said, "has evolved in the way he has looked at things. Campaign to governing are two different things and this president has been very, very flexible in terms of the realm of what is possible." The president reportedly signaled his new stance on the wall during a meeting with lawmakers earlier this month. In an interview with the Wall Street Journal last week, the president said "the wall's never meant to be 2,100 miles long ... you don't need a wall where you have a natural barrier that's far greater than any wall you could build. As The Washington Post notes, "... in recent days [he] has reiterated his desire to build a border wall that would be funded by Mexico 'indirectly through NAFTA.'" And, in an early morning tweet on Thursday, the president said, "The Wall is the Wall, it has never changed or evolved from the first day I conceived of it." Kelly also told caucus members that he had tempered Trump's negative view of DACA and that the president was committed to finding a solution to replace the program, which protects some 780,000 so-called "Dreamers." "There's no doubt in my mind there's going to be a deal, so long as men and women on both sides are willing to talk," Kelly told Fox News. However, as NPR's Kelsey Snell reports, there's no immediate sign of a breakthrough on the issue, as Democrats insist that DACA is part of any deal to keep the government funded past a Friday deadline and conservatives "say they can't support any spending bill that paves the way for a future immigration deal that could favor Democrats."